RSMSSB Recruitment 2018 For 1302 Informatics Assistant Vacancies @rsmssb.rajasthan.gov.in : Rajasthan Subordinate and Ministerial Service Selection Board (RSMSSB) has released a notification for the recruitment of 1302 Informatics Assistants. Interested candidates may check the vacancy details and apply online from 08-03-2018 to 06-04-2018. More details about RSMSSB Recruitment (2018), including number of vacancies, eligibility criteria, selection procedure, how to apply and important dates, are given below.. Selection of candidates will be made on the basis of Written Examination and Typing Test. 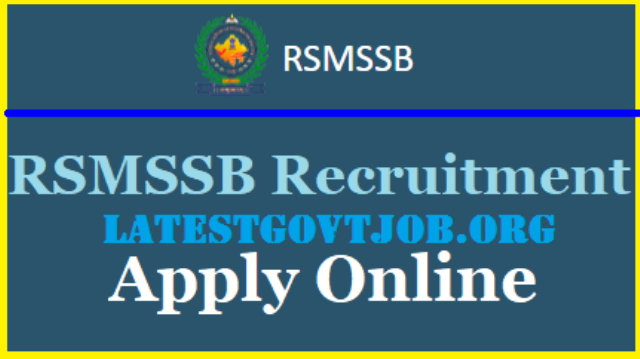 Interested and eligible candidates may apply online through RSMSSB website - http://rsmssb.rajasthan.gov.in/ - from 08-03-2018 to 06-04-2018.